On May 9, the Wisconsin Health Information Management Association (WHIMA) awarded Wil Limp with its highest award, the “Distinguished Member Award,” which honors outstanding WHIMA members for their contribution to the health information management (HIM) profession and for their loyal service to the association. Limp is the program manager of the online UW Health Information Management and Technology (HIMT) bachelor’s program offered by UW-La Crosse, UW-Green Bay, UW-Parkside, and UW-Stevens Point. Limp has been highly involved in the HIM field for more than a decade, first as an account manager for a private health record company, then as director of HIM for a healthcare system, and now as an educator and HIMT degree program manager. He earned his master’s degree in health information and informatics management and is a certified Registered Health Information Management Administrator (RHIA). He also is program manager for the new online UW Master of Science in Healthcare Administration program. WHIMA also recognized Limp for being active at all levels within the WHIMA organization; contributing through publication, teaching, and educational presentations; and showing leadership, innovation, and creativity. 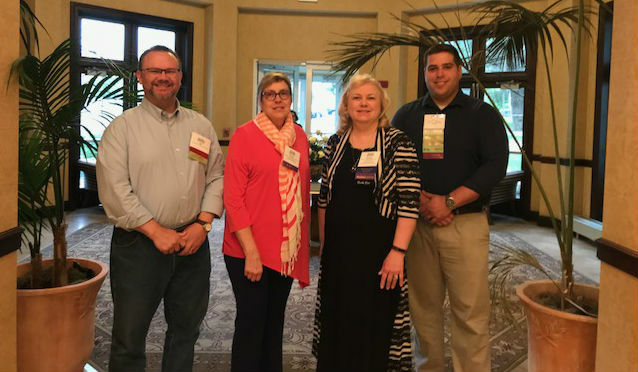 Pictured (l-r) representing the UW HIMT program at the annual WHIMA conference: Wil Limp, Brenda Tyczkowski (HIMT Academic and Program Director at UW-Green Bay), Betty Rockendorf, Charles Wessberg (HIMT student at UW-Stevens Point, WHIMA Spirit Committee Chair). Limp received the award at WHIMA’s 2018 annual conference, which was held in Elkhart Lake, Wis. from May 9 to 11. More than 500 people attended the three-day conference. This isn’t the first time UW staff has been recognized for its service to the HIM field. In 2016, Betty Rockendorf, the UW HIMT program director at UW-Parkside, received the WHIMA Distinguished Member Award. Now, she’s going to serve one year as president of the association. Rockendorf has served on the WHIMA board since 2015, and in May, worked with the board to develop the association’s strategic plan for the next two years. At UW-Parkside, Rockendorf advises students in the UW HIMT program. According to Rockendorf, professional networking is key to success in the HIM field, and she encourages students to take advantage of the industry expertise and wide-reaching HIM connections that she, Limp, and the rest of the HIMT faculty and advisors bring to the program. For questions about WHIMA, advancing your HIM or health IT career, or networking in HIM, feel free to contact Wil Limp at william.limp@uwex.edu. For specific questions about the University of Wisconsin Bachelor of Science in HIMT, contact an enrollment adviser at learn@uwex.edu.